Nestled in an ideal location in central Hamilton Island, a part of the world-famous Whitsunday Islands, you’ll find the Palm Bungalows. You will love the convenience and privacy of your own modern self-contained bungalow set among lush tropical gardens and just back from stunning golden sandy beaches. Close to all the amenities and attractions Hamilton Island offers, Palm Bungalows really is the perfect spot to base yourself while staying in the Whitsundays. Consisting of 49 freestanding bungalows, all set among charming flora, the Palm Bungalows has a tranquil atmosphere and private feel. 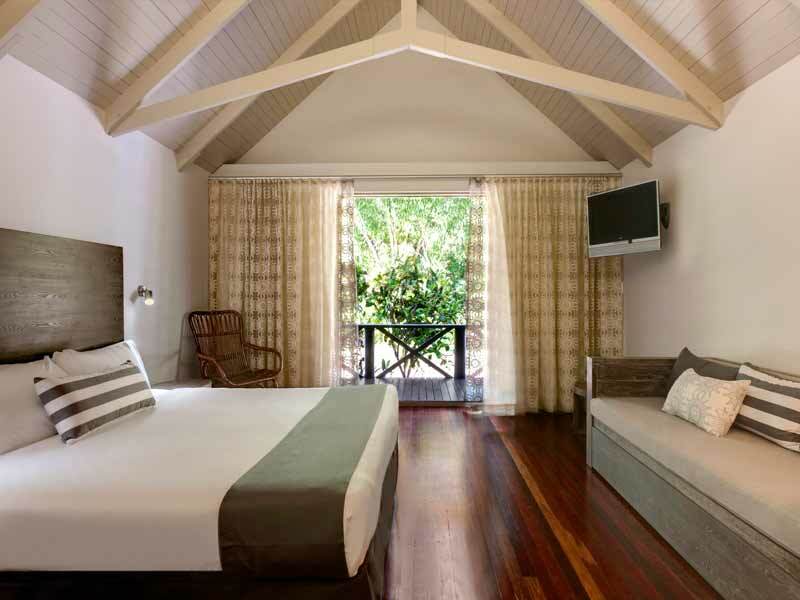 The resort has a fantastic location in central Hamilton Island –close to the stunning Catseye Beach with its long stretch of golden white sand, the pools, restaurants, shops and all the amenities you could want while on holidays. Why not pamper yourself with a massage or one of the luxurious body treatments available at Spa Wumurdaylin, where you can rejuvenate and renew your body and mind? If you’re in the mood for a workout, you can use the fully-equipped fitness centre and gym, which has a range of cardio and weight bearing equipment. When you need some child-free time, you can use the Clownfish Club day care centre which provides your children with a safe and fun environment full of interesting activities. Why go to Palm Bungalows? The bungalows are well maintained and feature a modern and stylish design with quality furnishings and finishes throughout. 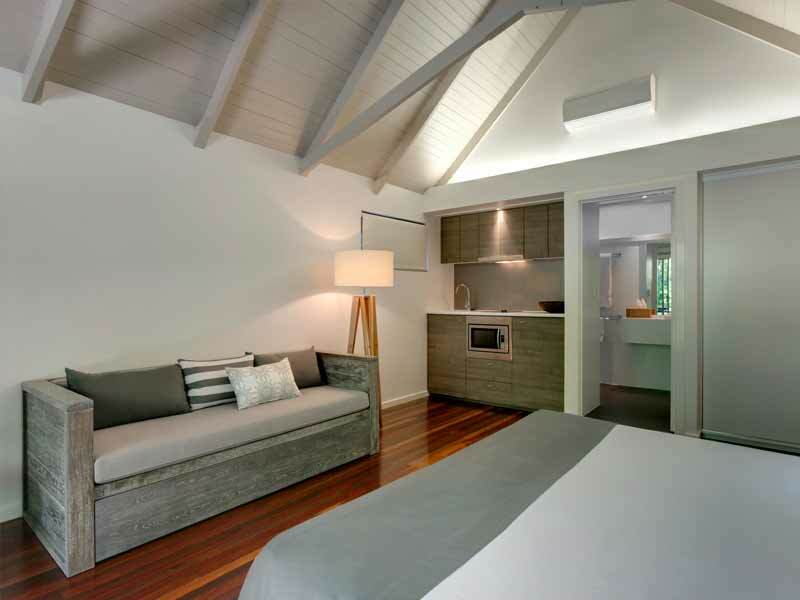 Because they are freestanding and surrounded by beautiful tropical gardens, the bungalows are private and quiet providing a serene retreat during your stay on Hamilton Island. This is an ideal location that is central to everything that Hamilton Island has to offer and allows you to experience the region in a hassle-free and relaxed way. 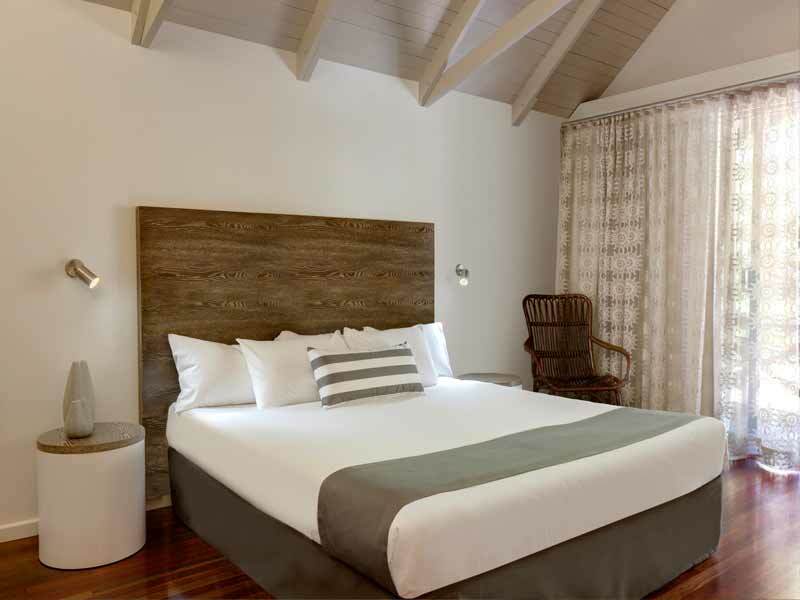 Featuring a design of light colours with more earthy finishes such as natural timber and woodgrain, your bungalow has a comfortable and modern feel. Being freestanding and surrounded by beautifully manicured gardens, you have privacy to enjoy your space. Your bungalow has a secluded balcony with table and chairs and a hammock that is perfect to lounge in and let the stress of the world melt away. The bungalow is a spacious 43sq. metres in size and is furnished with a King-size bed, making it suitable for 2 adults or 2 adults and up to 2 children with the addition of rollout beds. 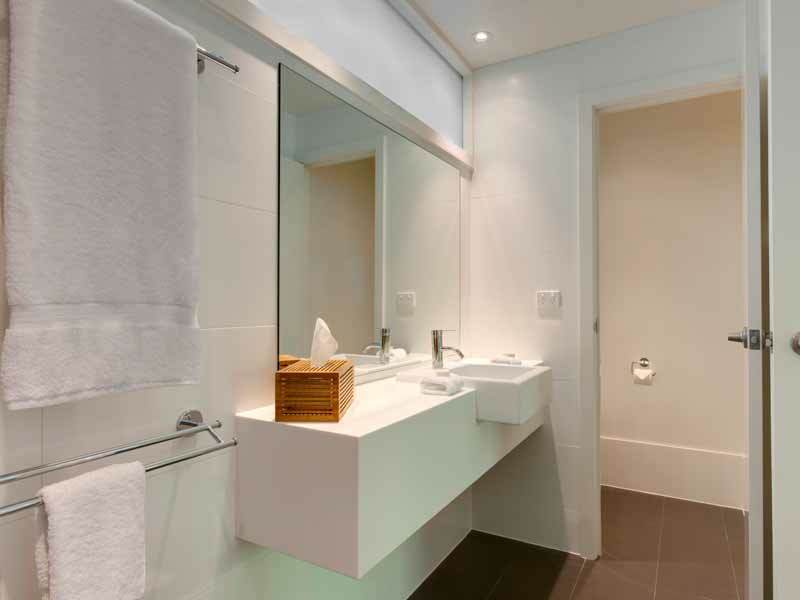 There is also an ensuite bathroom with shower and bathroom amenities. When you’re ready to escape the warm subtropical weather, your bungalow is air-conditioned and comes with a flat-screen TV and Wi-Fi for your enjoyment. Each bungalow is self-contained and comes with a kitchenette that has a stove top, microwave, toaster and bar fridge. You also have tea and coffee making facilities. Located in central Hamilton Island, among the world-famous Whitsunday Islands in northern Queensland, the Palm Bungalows is close to everything this tropical paradise destination has to offer. Its central location means that almost everything is within comfortable walking distance, although a free shuttle bus is available to take you anywhere on the island. The pristine Catseye Beach is just a short stroll away, as is the pool, marina and a vast number of other activities and attractions. Being centrally positioned in Hamilton Island means that the vast range of activities on the island are close at hand. You have direct access to a stunning sandy beach which is perfect for soaking up the warm sunshine. You can also try sailing, parasailing, jet skiing, paddle boarding and kayaking just to name a few of the water sports available. When you’re ready for a change from the ocean, head for the pool where you can enjoy the cool water or relax in one of the sun lounges. Delight in a round of golf on the local 18-hole course or strike out on a bushwalk through the abundant natural forest areas around the island. Hamilton Island provides you with an ideal gateway to the Great Barrier Reef, an amazing natural wonder to visit. Enjoy a day trip out to some of the most incredible coral reefs in the world. You can snorkel and dive if you want to get up close to the wonderful variety of marine life that lives in and around the reef. There are so many other things to do on Hamilton Island, from scenic helicopter flights to art classes, go-cart racing and ten-pin bowling. 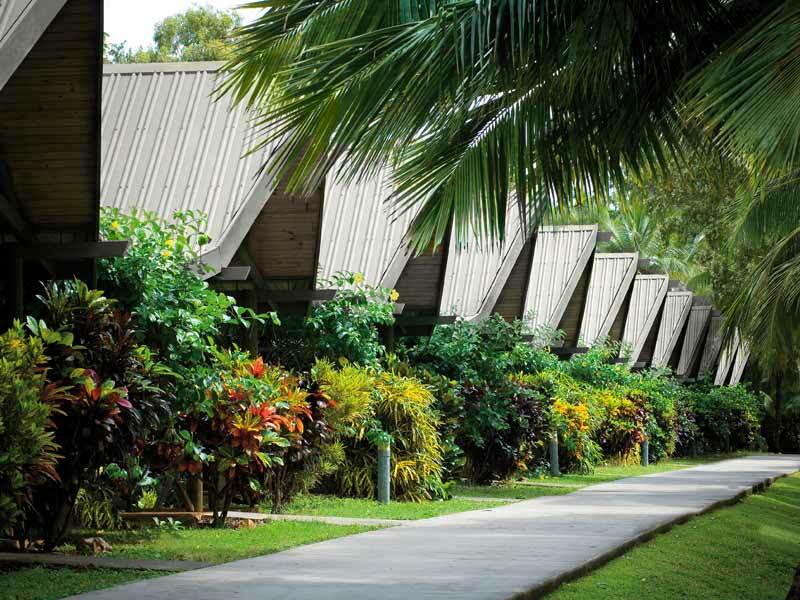 You will find something to suit everyone and every budget at Hamilton Island Bungalow Resort. We had an amazing time. We loved the bungalow, location and the sea view. It is the one of the best locations on the island! The beach and the pools were outstanding and the food was absolutely delicious. Thank you very much to all the wonderful people working there. It was one of the best vacations we’ve ever had.